Lizzie Skurnick Books, 9781939601261, 163pp. In the fifth and final book in the All-of-A-Kind Family series, Ella, the eldest child of the family, has been offered a stage career by a Broadway talent scout. While Ella wants to sing more than anything else in the world, she finds herself torn between Jules, her beloved fiance who has just returned from World War I, and what's sure to be a tough uphill climb to stardom. Once again, the loving all-of-a-kind-family provides the support needed for Ella to make the right decision. 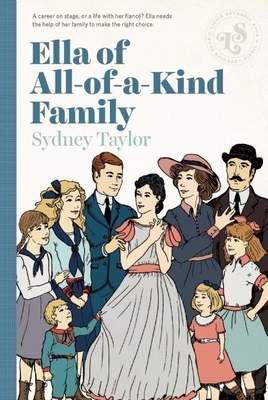 Born in 1904 on New York's Lower East Side, Sydney Taylor was one of the first authors of children's books centered on Jewish characters, and is especially known for the immensely popular All-of-a-Kind Family series. The Sydney Taylor Book Award is given each year by the Jewish Association of Libraries to a book for young people that authentically portrays the Jewish experience. Born in 1904 on New York's Lower East Side, Sydney Taylor was one of the first authors of children's books centered on Jewish characters. She didn't begin writing until she married and had a daughter, to whom she told bedtime stories about growing up with five sisters. She wrote a manuscript and put it in a drawer, and it wasn't until her husband secretly submitted it to Charles A. Follet Award for Writing that Taylor's bedtime stories became the immensely popular All-of-a-Kind Family series. Taylor died in 1978 at the age of seventy-three. The Sydney Taylor Book Award is given each year by the Jewish Association of Libraries to a book for young people that authentically portrays the Jewish experience.